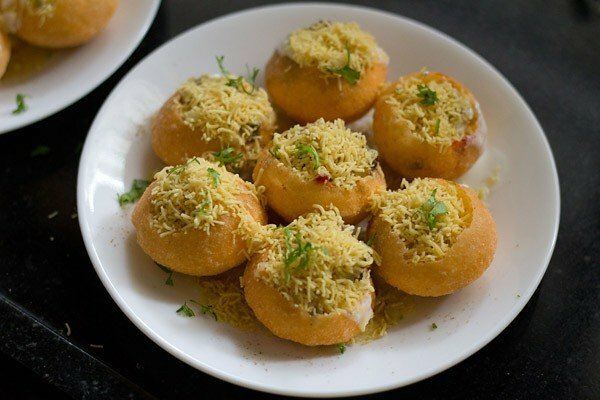 dahi puri also known as dahi sev batata puri is a delicious, yummy, chatpata chaat snack from mumbai. it is sweet, sour, tangy, spicy and crispy chaat. 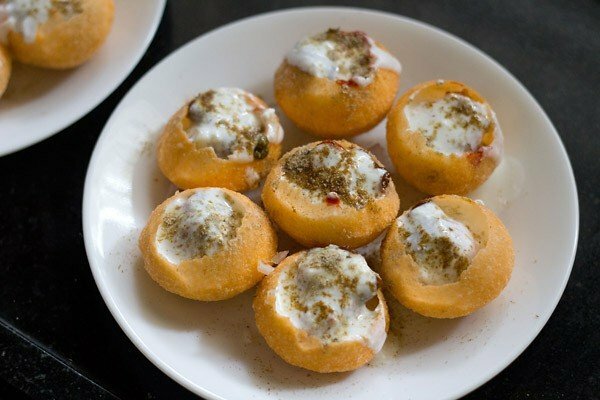 Dahi Puri Recipe with video and step by step photos. 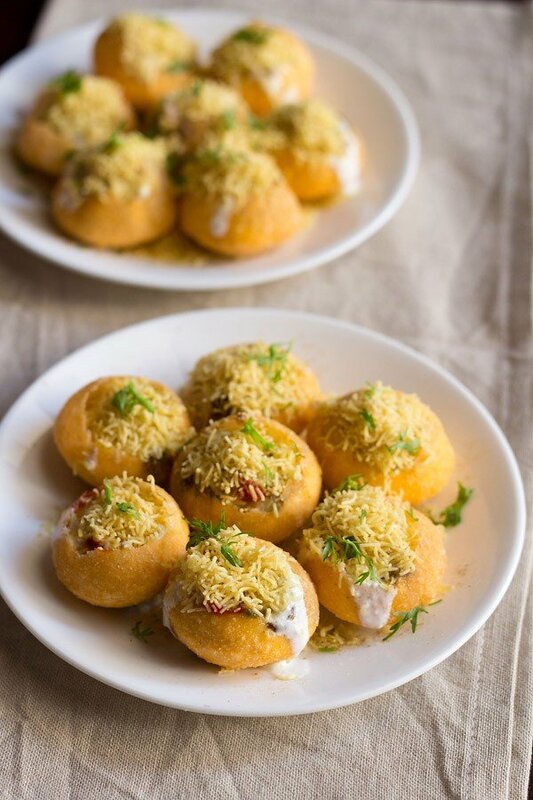 Dahi Puri is a delicious, yummy, chatpata chaat snack from Mumbai. 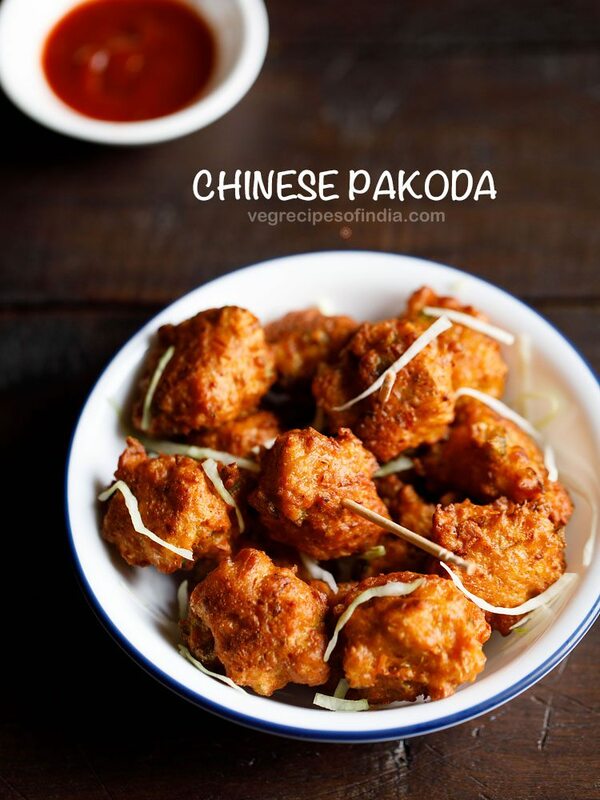 It is sweet, sour, tangy, spicy and crispy chaat with so many flavors and taste bursting in the mouth. 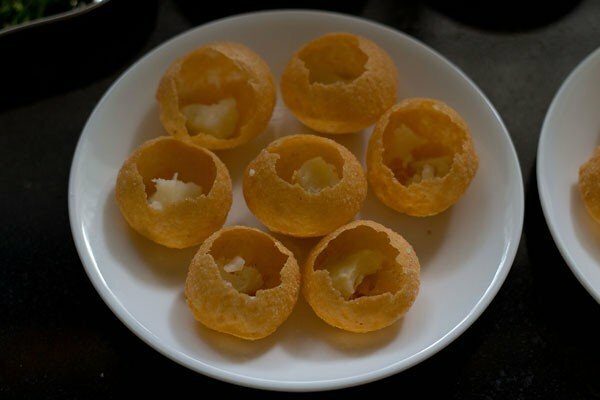 Dahi Puri is also known as “dahi sev batata puri” or “dahi sev puri”. 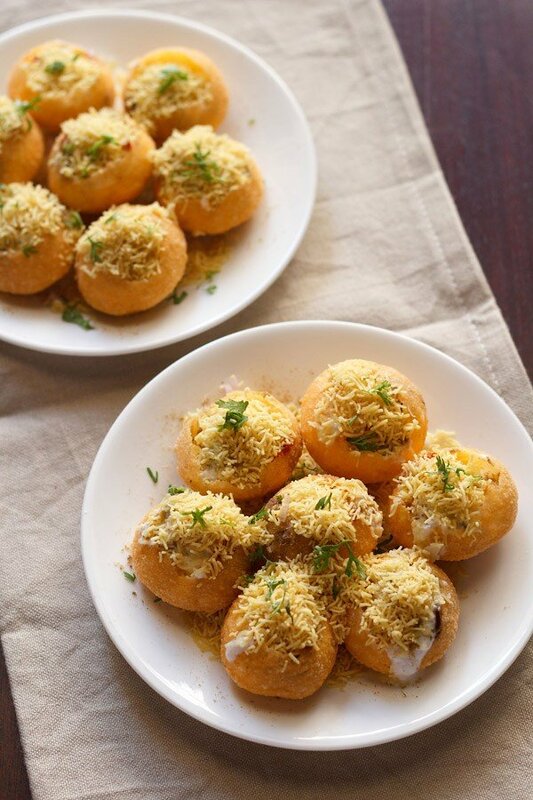 This chaat has its name Dahi Sev Batata Puri, since dahi (yogurt), sev (fried thin gram flour vermicelli), batata (aloo in hindi or potato in english) and puris are used to make this awesome snack. 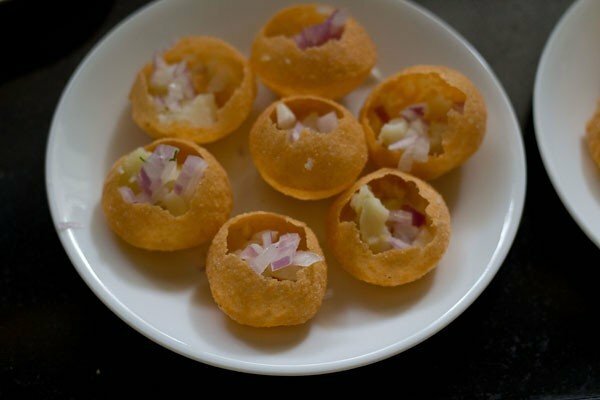 The puris are the round puffed puris that are used for making pani puri. Batata is a marathi word for potatoes. 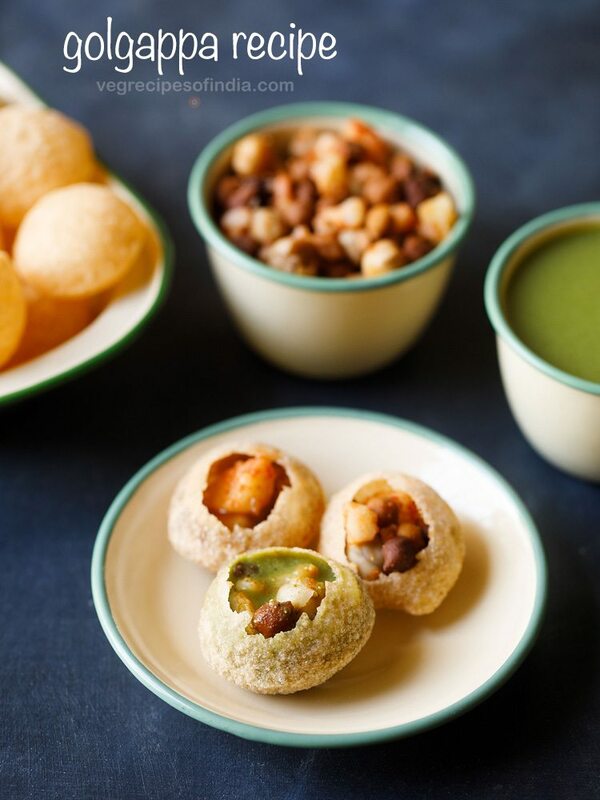 Apart from these four ingredients which make up this chaat’s name, three kinds of chutneys are also added in dahi puri. These three chutneys are added to most chaat snacks. You can make these chutneys at home or buy from outside. Green Mint Coriander Chutney – Chutney made from fresh mint leaves, coriander, lemon juice and salt. Sweet Tamarind Jaggery Dates Chutney – Sweet chutney made from tamarind, dates and jaggery. Apart from this chutney you can also use Saunth Chutney, which is made from tamarind, jaggery and dry ginger powder. Red Chutney – Hot and spicy chutney made from dry red chillies and garlic. 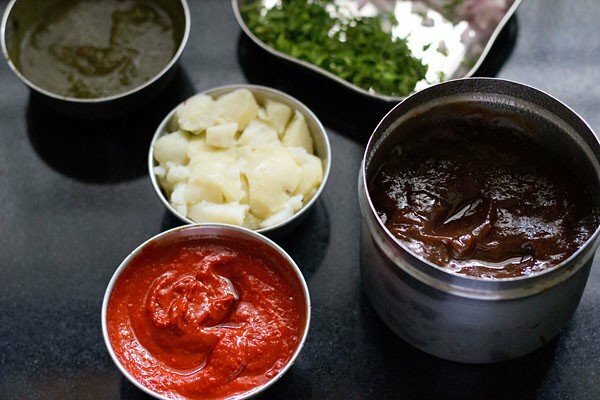 The Red Chutney is an optional one and you could make it if you want to add some heat and spice to the chaat. 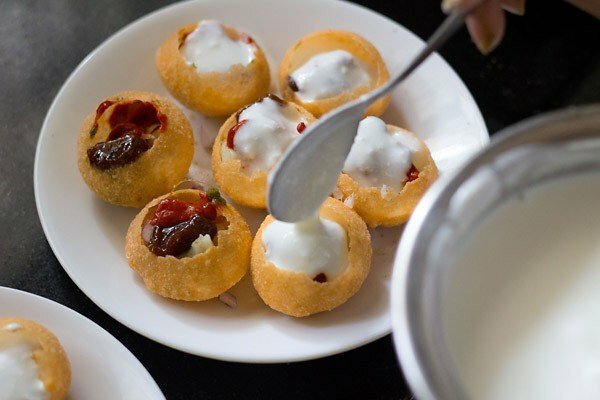 While making Dahi Puri – Some people also add chopped onions and tomatoes. Sometimes i add them and sometimes i skip. To make this chaat a bit more healthier, you could also add boiled moong sprouts and boiled chana (white chickpeas) with the potatoes. Dahi Batata Puri Recipe is absolutely simple to make if you have the puris, chutneys and sev ready. You can make the chutneys a day before and refrigerate. The job becomes easier as then you just need to boil the potatoes. The pooris can be brought ready made or made at home in advance. Firstly prepare all the chutneys and keep aside. I have given links for the recipes in the post. You can also make the chutneys a day before and refrigerate them. Beat the yogurt (curd) with a wired whisk till smooth. 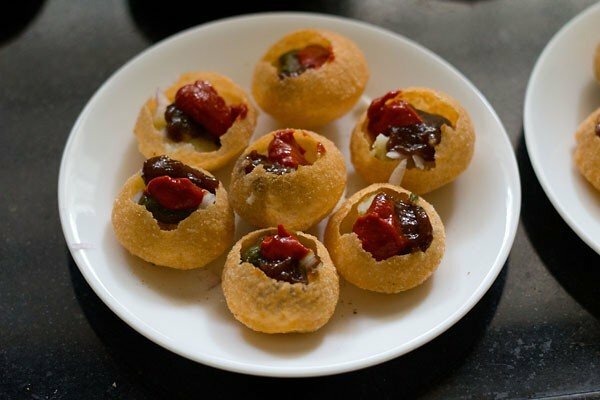 In a plate, arrange the puris or golgappas. You decide the number of puris to be served in each plate. Break the puris from the center to create space for the potatoes and chutneys. Stuff the chopped potatoes in the pooris. Now add the chopped onions, tomatoes on top of the potatoes in the puris. At this stage you could sprinkle some chaat masala, jeera powder, red chili powder and black salt on the puris. This step is optional. Top the stuffed puris up with the green chutney, sweet chutney and red chutney. Top the chutneys as per your liking and taste. 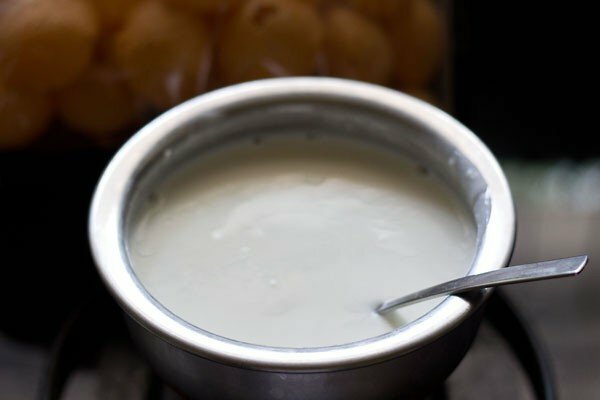 Add the curd (yogurt) in each poori. Now again sprinkle all the four dry masalas i.e chaat masala, roasted cumin powder, red chili powder and black salt. 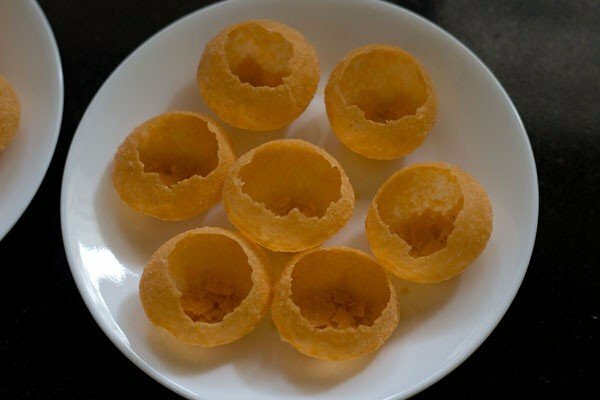 Add the sev on top in a way that each poori gets covered with sev. Finally garnish dahi puri chaat with chopped coriander leaves. 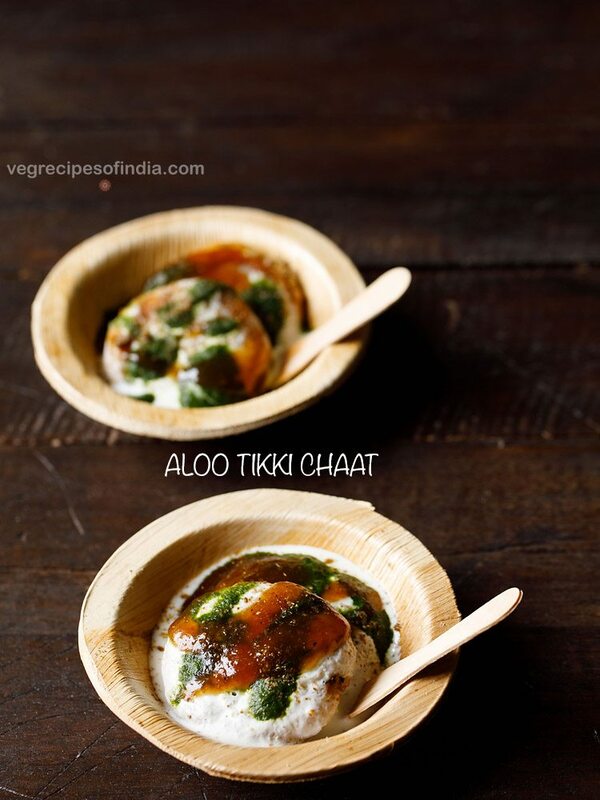 Serve Dahi Puri Chaat as soon as you make it as the puris become soggy if you serve even after a few minutes. 1. Chop the boiled and peeled potatoes. Chop the onions, tomatoes and coriander leaves finely. Keep the pooris or golgappas ready. Also, keep the green mint coriander chutney, sweet tamarind jaggery dates chutney and red chutney ready. The proportion of the sweet chutney is more as i prepare quite an amount of it and it comes handy when serving with pakoras, samosa, kachori, dahi papdi chaat or dahi vada or any chaat snack. 2. Whip the curd/yogurt till smooth with a wired whisk. If you prefer, you can also use chilled yogurt. The yogurt has to be fresh and not sour. No need to add any sugar in the yogurt as the sweetness from the tamarind dates chutney will be enough. 3. In a plate, arrange the puris or golgappas. You decide the number of puris to be served in each plate. Break the puris from the center to create space for the potatoes and chutneys. 4. Stuff the chopped boiled potatoes in the pooris. 5. Now add the chopped onions, tomatoes (if adding them) on top of the potatoes in the puris. At this stage you could sprinkle some chaat masala, jeera powder and black salt on the puris. This step is optional. 6. 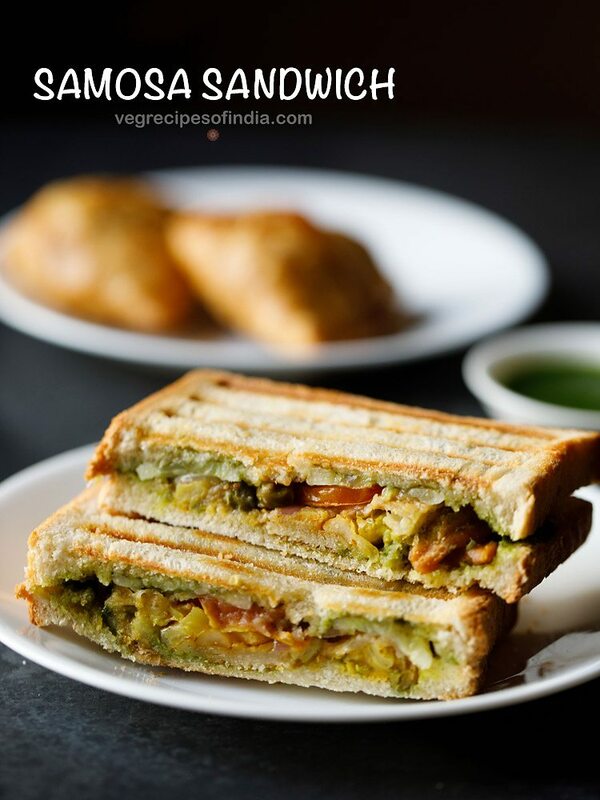 Top the stuffed puris up with the green chutney, sweet chutney and red chutney. Top the chutneys as per your liking and taste and also the taste of your family members. If you like a sweet taste, then add more of the sweet tamarind chutney. If some one prefers spicy, then add more of the green and red chutney. If making for kids, then just add the sweet chutney. 7. Now add the whisked curd/yogurt or dahi. 8. Now again sprinkle the four dry masalas i.e chaat masala, roasted cumin powder, red chili powder (optional) and black salt. 9. 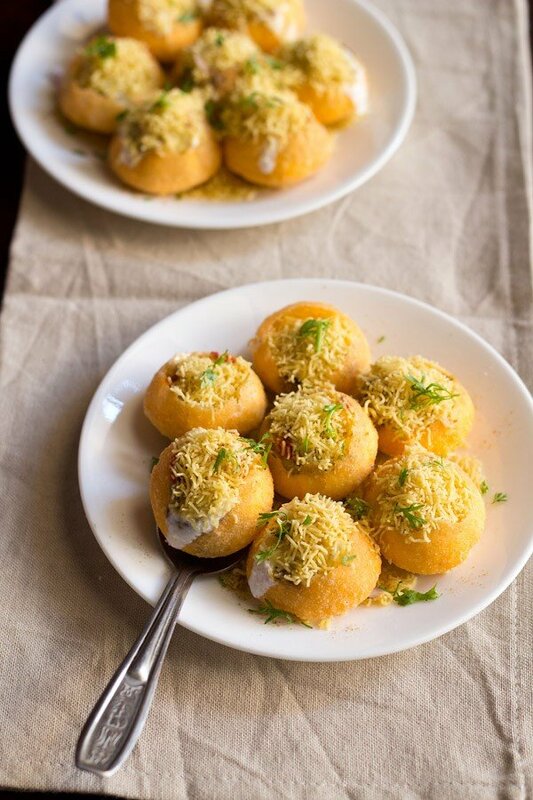 Add the sev on top in a way that each poori gets covered with sev. Finally garnish dahi puri with chopped coriander leaves. 10. 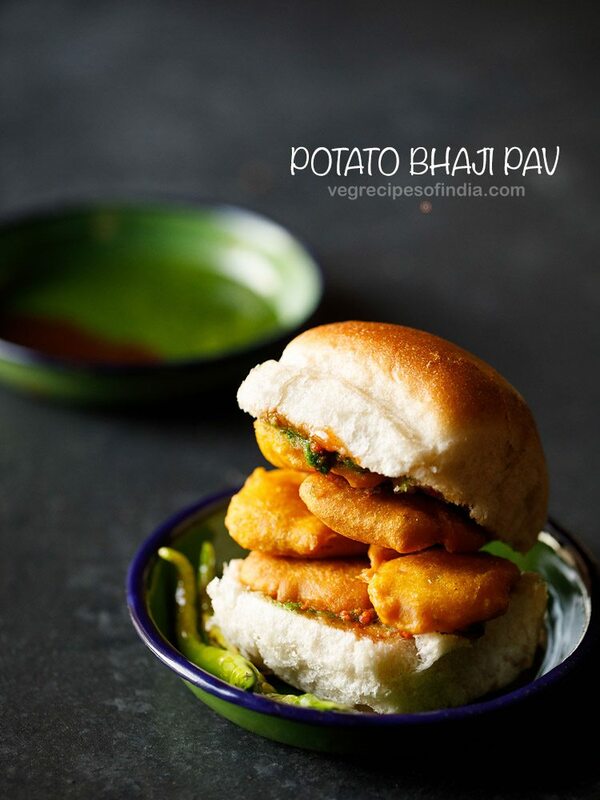 Serve Dahi Batata Puri Chaat as soon as you make it as the puris become soggy if you serve even after a few minutes. 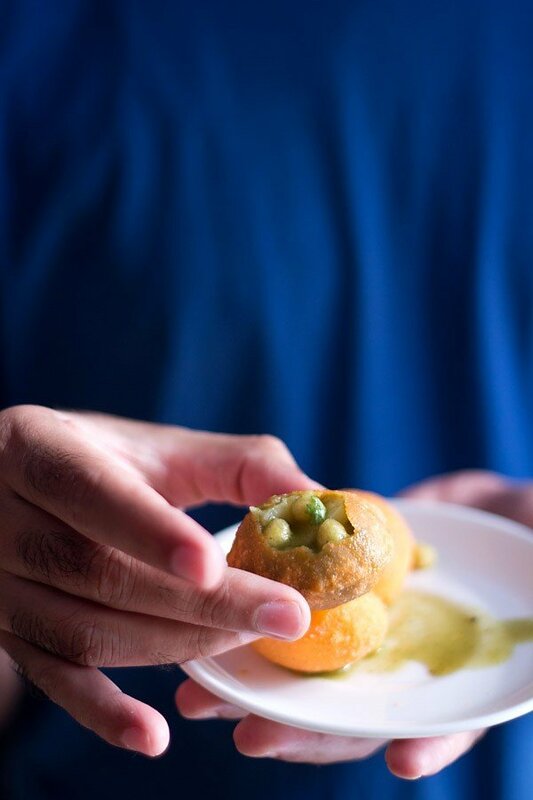 Relish and savour each and every bite of yummy Dahi Puri with your loved ones. I know this is wrong… but at 1 place… dahi has become Devi ??? thanks. wonder how it happened. i feel it devi’s grace coming on the website. thanks again for letting me know. i have changed it. Welcome Anita. Will try to add. I made the dehi batata puri. The taste was very good. Thank you. I admire the way you explain recipes step by step with beautiful & related photos. welcome bhumika. glad to know that you like the recipe presentation. How are You?? First of all thank you for posting delicious items. Actually there is a competition in our office to prepare chat items without fire. 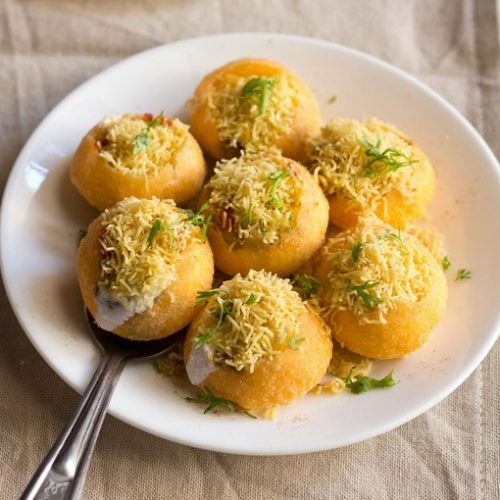 My colleague and myself were searching some items in google and got this link and no second thought we have decided to go with Dahi Sev Batata Puri. Amazing!! Everyone liked our chat and got good appreciation. Keep posting this kind of items. Its very helpful for us. hi sunitha, i am fine. good to know. thanks and do try other recipes as well. Thanks alot for such a mouthwatering n chatapati recipe. mmmmm it looks so yummmmyyyyyyyyyy!!!!!!!!!!!! !